Anika Elias scores 5 goals to lead the Eagles. 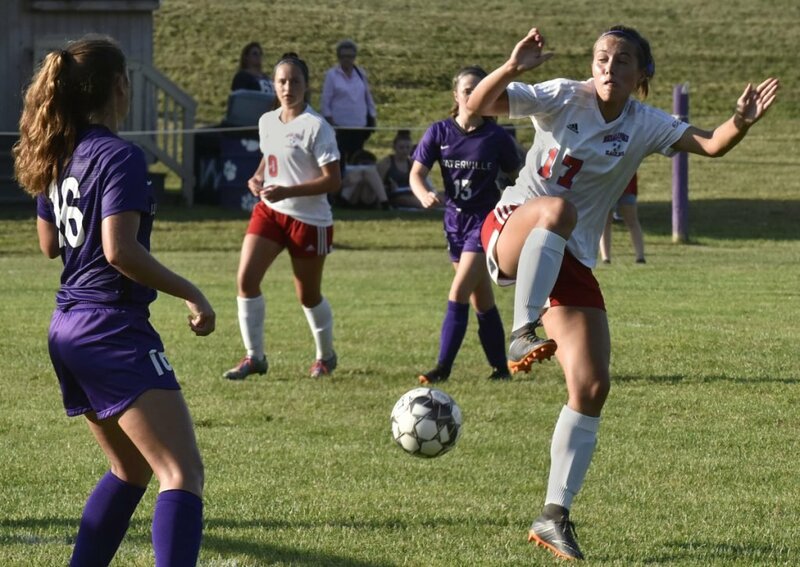 Staff photo by David Leaming Messalonskee's Lily Wilkie knees the ball as Waterville's Sophia Poole, left, and Jess Bazakas pressure her during a game Tuesday in Waterville. 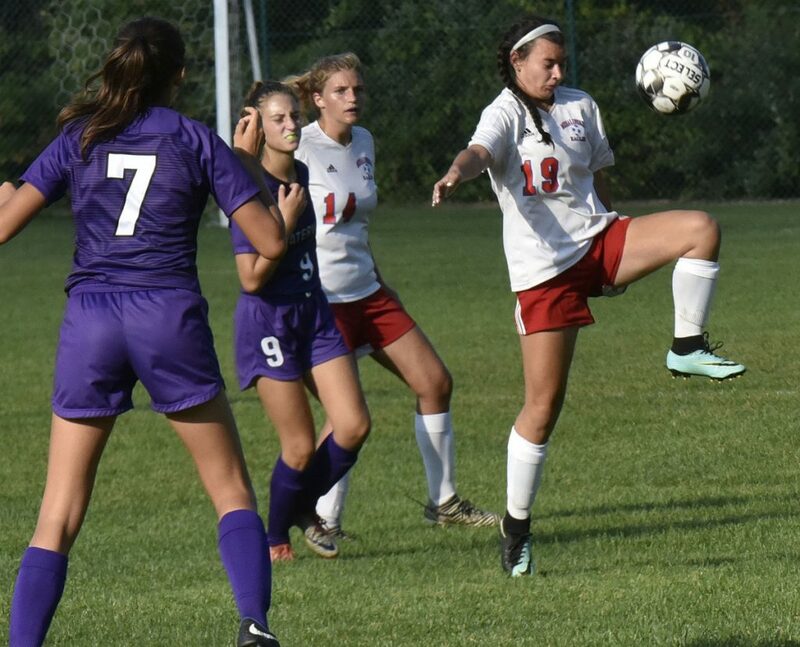 WATERVILLE — The Waterville girls soccer team had a pretty good idea what to expect from Messalonskee striker Anika Elias on Tuesday. After all, the senior was a mainstay for the Purple Panthers until her family moved to the Oakland area after her junior year. “She was all-New England last year,” Waterville coach Mark Serdjenian said. Elias played that way for the Eagles, too, scoring five goals to lead Messalonskee to a 6-0 victory at Webber Field. Messalonskee is 5-1-0 in Class A North, its only blemish an opening day loss to Camden Hills. Waterville falls to 3-4-0 in Class B North. The Purple Panthers held on in the first half, limiting the Eagles’ chances with an effective offsides trap. Still, the Eagles took a 2-0 lead on a penalty kick from Elias and a breakaway goal from sophomore Cloe Sissson, who was sent in alone on a pass from senior Edin Sisson. The Eagles began playing the ball wide instead of up the middle in the second half and limited their offsides infractions. Staff photo by David Leaming Messalonskee’s Edin Sisson kicks the ball as Waterville’s Jayda Murray defends during a game Tuesday in Waterville. In any case, Messalonskee dominated the second half out-shooting the Panthers 12-0. 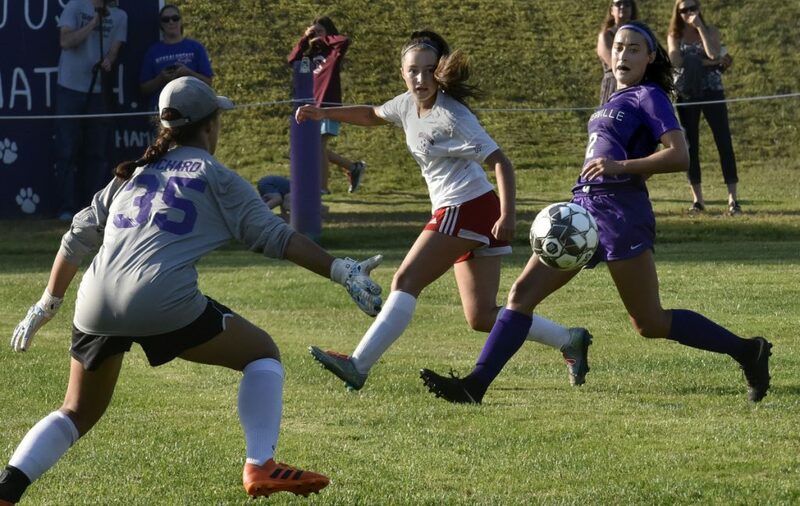 They maintained their aggressive approach and swarmed the Waterville defense and goalkeeper Jacie Richard (nine saves). Elias scored all four goals in the second half beginning with a steal from a Waterville defender that resulted in an easy chip past Richard. The final 40 minutes was more than a one-girl show, though. The Eagles have nine seniors and a deep bench and substituted six at a time about every 10 minutes. Elias got her breaks, too, but the ball seemed to find her feet on many of her runs. “We have a great (midfield) and a great defense to get me the ball so I give all the credit to them, too,” Elias said. Staff photo by David Leaming Waterville goalie Jacie Richard (35) makes a save on a shot by Messalonskee’s Caitlin Parks on Tuesday in Waterville. Elias, who has already committed to Division II Georgia College on a full scholarship next fall, was the recipient on three nice passes on three goals she scored in the final 15 minutes. The first came from midfielder Caitlin Parks, who worked her way down the right side and sent a long cross to the middle of the goal. Maya Chalmers sent Elias in alone with a short chip pass to make it 5-0 and Elias capped her big day with a run down the right side following a pass from Sarah Lowell. 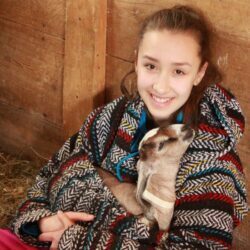 Messalonskee keeper Megan Wilson made her first varsity start and was rarely tested. She made the stop of the day on a point-blank shot by Paige St. Pierre in the first half. She was involved in the action though as her teammates often played the ball back to her and she jump-started the offense.